These are all terms that are overlapping concepts dealing with mimicking nature to restore the land, grow food and ending the negative effects of climate change due to factory farming [technically called “Concentrated Animal Feeding Operations or CAFOs]. Adaptive Multi Paddock grazing – better for the soil, better for the cattle, better for the Earth. time, while other paddocks have a chance to grow and regenerate at an accelerated pace. What made this possible was the highly efficient very lightweight electric fencing that can be moved around to different paddocks by a single person. 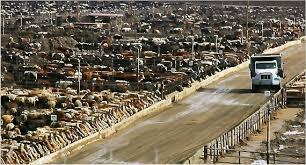 Feedlot feeding – an environmental disaster and cruel to the animals. All the above can be sourced fairly easily by google searches on the bulleted terms used at the beginning of this essay. More and more ranchers/farmers are moving in all these directions. I won’t go into no-till farming but the wiki entry on it covers it ok: https://en.wikipedia.org/wiki/No-till_farming But losing the plow and gaining the ‘seed-drill’ form of farming helps in restoring our soil as well and virtually eliminates dust-bowl loss of soil due to wind erosion and boost soil organic matter a lot. Raising cows on concentrated animal feeding operations (CAFOs) to produce beef is one of the most environmentally destructive practices on the planet. Unfortunately, while far healthier and environmentally friendly grass fed beef has the potential to solve many of the problems that CAFO meats have caused, CAFOs remain the primary method of livestock agriculture in the U.S. and increasingly in countries like Brazil, Uruguay and Argentina. Rather than quickly phasing out their use to stave off environmental and public health decline, their use is actually growing. Ralph and Mya are 100% accurate as to the destructive nature of CAFOs for pigs, chickens and especially cattle. It produces inferior animal proteins for our species and is destructive beyond the issue of the animals themselves (treated cruelly and disgustingly. Not enough can be said to condemn this sort of practice). Massive mono-crop growing of corn and soybeans has caused the destruction of rain forest and as importantly grasslands and Sahel type regions of the developing world leading to the massive desertification of regions hitherto spared the effects of drought. It should be pointed out that the safety & working conditions are some of the worst in the capitalist industrialized world and wages of workers in this industry are usually rock bottom. Unions have, globally, failed to penetrate this industry and thus 95% of the workers are non-unionized. 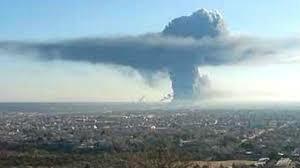 Chemical fertilizer plant explosion in West Texas in 2013. There’s a reason that the ingredients for chemical fertilizers are so explosive: They were developed from the munitions industry! More bad news: true modern agriculture started after WWII with the massive synthesis of two components: mechanized agriculture allowing a single farmer to feed several thousand people and the chemical industry, as an out growth of, interestingly, WW I and WWII explosive manufacturing as a function of the massive expansion of the “destructive forces of production” during these wars. They came together on the petri-dish of modern commodity production and distribution. The final alienation of town and country forever set in the concrete of capitalist political economy metaphorically bound by the interstate highway system, the grown of post-war suburbia and the codification of the nuclear family. But if one goes back to Marx and Engels one can find the germ of this as noted in the quote from Capital at the top of this document. The purpose of this contribution is to realize several things. 1. ALL this destruction and brought on by CAFOs and it’s evil twin, factory farming, has contributed greatly to not only climate change but the destruction, as noted above, of the natural prairie/steppe/Sahel/Pampas/savanna grasslands not to mention the better known destruction of the Amazon rain forests. 2. All this has created a depletion of the soils around the world. Where as natural grasslands like North America’s Great Plains had organic matter – the percentage of organic carbon in the soil – and general indicator a soils health – of over 8% and higher. Ruminants in the form of bison (from a low of 30 million to an estimated high of 60 millions) roamed the eastern high plateaus and Rockies all the way to the Appalachia Mountains to every state in in the South. Additionally scientists have estimated that, before the arrival of Europeans, North America supported some 40 million whitetail and 10 million mule deer. That is close to 100 million ruminants eating grass and nothing but grass from coast to coast, from the Arctic Circle to well into Mexico. That is *more* than the highest number of cows I could find currently being raised in the US and Canada which is 89 million. 3. The natural cycle of the herding section of the historic ruminants works like this. Bison would group together by the thousands. Driven together in tight packs by predators, mostly wolves, coyotes, cougars, bears and…very importantly…the native peoples…the bison had to eat quickly and, without regard to quality. Sure, the would try to eat the sweeter, top 2/3 of the grasses and legumes, but because they were grouped together, they had to be less picky. And, they were *always* on the move, trampling into litter the remaining grasses. From 2002 to 2012, the total number of livestock on the largest U.S. factory farms rose by 20 percent, according to data released by advocacy group Food & Water Watch, producing 369 million tons of manure — 13 times the amount produced by the entire U.S. population. Further, livestock production contributes close to 15 percent of global greenhouse gas emissions to the environment, which is more than the transportation industry. In a revealing investigation by The Guardian, using methodology created by the U.N.’s Food and Agriculture Organization (FAO), it’s noted, “The top 20 meat and dairy companies emitted more greenhouse gases in 2016 than all of Germany, Europe’s biggest climate polluter by far. If these companies were a country, they would be the world’s seventh largest greenhouse gas emitter. In stark contrast, switching to grass fed beef not only can cut greenhouse gas emissions but also offset them completely by helping to sequester carbon into the soil. This last statement, of course, is very controversial and certainly debated among agronomists, atmospheric physicists and climate activists. By mimicking the natural behavior of migratory herds of wild grazing animals or “ruminants” as described above — meaning allowing livestock to graze in a planned manner and moving the herd around in specific patterns — farmers can support nature’s efforts to regenerate the soil and thrive. This kind of land management system promotes the reduction of atmospheric carbon dioxide (CO2) by sequestering it back into the soil where it can do a lot of good. Once in the earth, the CO2 can be safely stored for hundreds of years and adds to the soil’s fertility. “Adaptive Multi-Paddock (AMP) grazing uses high livestock densities for short durations between long periods of forage rest to catalyze accelerated grass growth. The system is not scheduled or prescriptive, but moves the animals in response to how land and life respond. AMP grazing is thus highly observant and adaptive. The system mimics the natural pattern of dense herds of wild ruminants moved frequently by the forces of predation and food availability. It is worth pointing out that photosynthesis is the most efficient use of solar energy around. Grass Fed Beef produced using AMP grazing show great promise to cut pollution. Researchers from Michigan State University and the Union of Concerned Scientists conducted a life cycle analysis to compare AMP grazing with standard CAFO, or feedlot, systems in the upper Midwest. On-farm beef production and emissions data were combined with a four-year soil carbon analysis to reveal that AMP can sequester large amounts of soil carbon. It makes perfect sense that Standard Soil states AMP grazing is so effective because it regenerates soil, as soil is an incredibly efficient carbon sink. Industrial agriculture is environmentally destructive in many ways. “The Green Revolution of the 1950s and 1960s introduced higher-yielding wheat and rice, hybrid maize, fertilizers and novel pesticides to farmers. The changes brought life-saving jumps in crop productivity, most profoundly in Asia. But globally, they drastically reduced the types of crops being grown. Unfortunately, as farmers increasingly plant mostly wheat, rice and corn (including for animal feed), more than 75 percent of crop genetic diversity has disappeared since the 1900s, “And that relentless march toward monoculture,” bioGraphic noted, “leaves the homogenous fields more vulnerable to devastation by drought, pests and disease.” Philip Lymbery, chief executive of Compassion in World Farming (CIWF), noted that ending the practice of grain-feeding animals could actually feed another 4 billion people. But, please note: “grain-feeding animals”… grass-feeding them can be integrated into grain grown for human production. “[T]he world’s largest meat and dairy companies … explain that their production is necessary for world food security, and that they should therefore be let off the hook, or better yet, get incentives for tinkering with their greenhouse gas emissions. This is not true. These companies produce a vast amount of highly subsidized meat and dairy in a handful of countries where these products are already over consumed. “CAFOs are known to destroy communities, polluting waterways, creating toxic air pollution and sickening area residents. Property values plummet when CAFOs are built, as does the local economy. While CAFOs often tout increased tax revenue when trying to venture into new regions, the reality is that they drain resources from the community, while purchasing supplies from outside the area and paying workers low wages, thus providing little to no economic stimulation and, in return, devastating environmental damage. “In stark contrast to industrial agriculture, the holistic approach to agriculture benefits local economies, according to research published in Renewable Agriculture and Food Systems. The study found that clusters of counties with high numbers of organic operations (organic hot spots) had a lower county-level poverty rate and a higher median household income compared to general agriculture hotspots. “The findings were so strong the researchers described hotspots of organic production as “local economic development tools” and said policymakers could focus on organic development as a way to promote economic growth in rural areas. I added the quote above to show some of the thinking now penetrating large-scale commodity distribution. Renewable Agriculture and Food Systems shows the thinking now among a segment of the commercial “organic” farming market. I say this because few of the *practitioners* of AMP or Holistic Management grazing use or seek the label of “organic” which, especially in the Mid West, is associated with the hippy-dippy (their words) organic food movement which this overview doesn’t deal with at all anyway, though in fact they overlap. Most of the ranchers and farmers involved in restorative and holistic management would easily pass any of the now-large-scale-commercial-dominated “organic (industry-DW) certification” quite easily. The term “grass fed” is what they use but be careful here as well…just because animals are pasture raised and grass fed doesn’t mean chemical inputs are not used. I have not dealt very intensely with the real center of this and my particular area of study which is soil health. I have not dealt with agricultural techniques that can combine mob-grazing and mimicking of nature to combine it with no-till planting, cover crop developments and pro-soil agro-techniques that can increase many times our agricultural output. Largely because this essay is all about restoring our grasslands and prairies to their natural health and thus saving the planet. Yes, I’ve gone over some things but most are generalities and focusing on grazing. There is a lot more to this that I can cover in a further document. Included in this is the breaking down of the barriers between town and country (again, noted by Marx in Capital) and reestablishing the social necessity of bringing a closer relationship between the working class and the soil in way that regenerates both. Most importantly I have not dealt with the repairing the Metabolic rift between the working class and the soil. 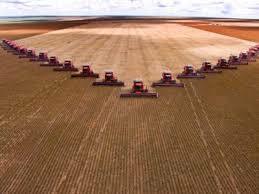 The alienation of labor from growing our food is one of the worst forms of capitalist initiated commodity production of agriculture effects. While this moves against perceived Marxist orthodoxy, we actually need to bring people back to the soil, in the same way we need to restore the soil. That is for another essay on the subject. By the use technology which only our species can develop such as electric fences, mechanized tractors, drone and satellite observation of soil conditions, advanced transportation, ever denser (and cleaner) forms of energy combined with advanced techniques in agriculture as described above in this essay, we can use nature, as Marx intended, to free the productive forces in a positive and human-orientated pro-development paradigm. This can only be accomplished under a communist society free of the all the constraints modern Capitalism imposed on us. Note from Oaklandsocialist: If you found this article interesting, please see the other articles on the environment that are on our blog site. Find them here. Good stuff comrades. Here in the UK the socialist organisations have always had somewhat of a lack of a programme on agriculture and rural issues. Such a programme would need to cover unequal land ownership, farming subsidies, rural poverty, countryside access, wildlife conservation and in this country – fox hunting and badger culling. The lack of a socialist programme has meant that those issues are championed by groups such as the Greens and the hunt saboteurs. For instance George Monbiot is almost the only one talking about EU subsidies. There are basically a chronologically developed program for socialists on ag. Thank you for sharing this informative article John. Animals are not ours to eat, wear, or experiment on! Nancy with all respect, a proper response from me would be “Yes, they are!”. But it leaves us nowhere really in the discussion. Humans evolved as hunter-gathers an were able to span the planet *because* they they ate their meat and wore their fur. Without out our species would never of evolved into the omnivores we are. As I tried point out above, we cannot survive on this planet without animals. It is how we use animals that is important and, effects our climate as well as out health. That’s where we disagree. Yes humans were hunters and gatherers at one time in our evolution, but more importantly we know now that we can live fine without eating animals or their products. Science proves this, and it is a more compassionate way to live. We need to move forward to creating a better world for all sentient beings, not be stuck in the “omnivore” past. Hi Nancy. Sorry I’ve take so long to reply. I think you actually hit the nail on the head now in some regards though it avoids the major point of my essay. Yes, for *once* with modern transportation it’s now possible to have a well rounded diet sans animals products because food can be flown in, trucked in and so on from any part of the globe. Just on the “science proves this”, yes, with B12 supplements (since around 98% of the planet can only get B12 from animal products) and of course, given how our bodies need concentrated proteins to avoid things anemia, a minority of vegans have had to give it up over the years because they can’t get the needed proteins from supplements (please not I said a “minority”). And supplements generally have been helpful, perhaps critical, in many vegan diets. So if you want to live like that (I choose not too) I support you 100%. One can do it without a doubt. But one really has to work at it. It is not always easy and *most* vegans I know in the Bay Area (not all) really do have to work at it. So I would dispute the concept that we can live “fine without eating animals or their products”. We can, but we really don’t live “fine” given what I said above. It’s all a question of personal lifestyle. For individuals many of us really like our protein in animal form (me, I’m partial to seafood and lamb). I don’t see this changing much. But…you avoided the central thesis of my essay: neither your vegan lifestyle nor my omnivorous one can exist without animal husbandry. It IS true one doesn’t need to actually *eat* animals to do this but no matter where our veggies come from that *carbon* harvested in the form of wheat or kale, has to be replaced or the soil dies. Today, in most countries but especially Brazil and the US/Canada, that comes from fossil fuel derived nitrogen fertilizers (along with insecticides, herbicides, pesticides, fungicides). Only using holistically managed intensive grazing can that carbon be replaced and even MORE sequestrated. Without animal husbandry, this can’t occur in any way holistically. So even if we don’t eat those cattle or those chickens and sheep, they need to graze. If you want to raise animals just to graze, then fine. But in my opinion wild animals like deer 🦌 can do that just as well. I’m against breeding animals just to create a market for people to eat their meat. Yes many people “prefer” to get their protein from animal sources, but that’s due mostly to habit. Just because someone does something out of habit does not mean it is the best way. I really question your statement aboutvegans in the Bay Area having a difficult time of it, as I’ve heard the opposite from people who live there, for example they say that there are a lot of vegetarian and vegan restaurants there. You should really read my essay here. I can’t see the huge expense of raising animals just for their manure simply as “fine” and some sort of non-nonchalant choice. Right now most organic farms use manure (chicken manure mostly). This means that the chickens have to be *economically* integrated or the farms will lose a lot of money. That means eggs and meat birds. My point of the essay is that cattle is the only truly *natural* way to build up organic matter in the soil. Nature has already done the R&D on this. It is *how* our soils were built (there are some exceptions). If we take carbon based organic matter out (as in vegetables and cereal grains) then an equal amount has to go back in. The individual life-style choice vegans make, which I defend, is fine for the soil *now* because there are so few vegans as a % of the population. But try growing enough wheat for flower and eggplants with non-manure composting…we would all likely starve. Quite seriously. Yes, but Nancy doing this on anything but a garden is virtually impossible. Growing vast fields of wheat in Kansas or fertilizing barely or broccoli in California can’t be done with plant based fertilizer…you’d get a diminishing return of carbon that way as you need to replace the carbon/organic matter in the green fertilizers…right? If you remove something from the land, you have to replace it. But think of all the land that is used for cattle farming! If we phased it out there would certainly be more room for people to have gardens!